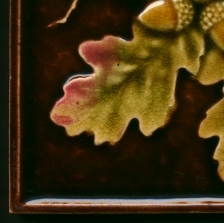 One very tiny corner chip, a little roughness to the tip of the rim, rubbing on the rim at corners, the only marks to the rim, the main surface is perfect. 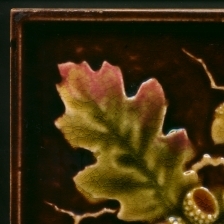 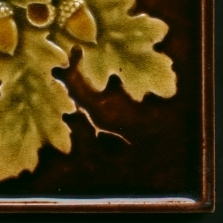 A good, fairly uncommon flora design of oak leaves and acorns in bright earth tones against a dark mahogant ground This type of style, floral with raised border had a urst of popularity in the late 1880s when multicolour majolice tiles became affordable and made an impact, The background brown is typical too especially for fireplaces as it reflects the warm glow of the open fire admirably. 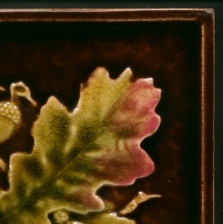 Verso stained, embossed registration number.